Belle View is an enchanting recently renovated two-storey colonial-style property situated on a peaceful hillside close to the beach, allowing splendid views of the turquoise sea. Each of the two living rooms open out to patios, the upper also opening out to the pool deck, making the line between indoor and outdoor living fade away. The two ample patios are perfect for relaxing in the heat of the day or watching the most amazing sunsets against a wonderful skyline. The open plan kitchen and dining area provides formal dining for eight while the upper patio provides less formal outdoor dining with a beautiful view. The large pool is situated in a very secluded spot and is completed with raised wooden decks. The raised area above the pool also offers an extra area for outdoor dining that is ideal as a cosy spot for either lunch or dinner. All the five bedrooms are fully air-conditioned, with an en-suite bathroom. Two of the five bedrooms can be found on the ground level and therefore are suited better to those who might have problems with stairs. Each bedroom has been carefully decorated with an eye for detail! The high white ceilings lend an airy atmosphere to the whole house while the wooden floors and colonial pieces add a tropical accent. Belle View sits in the perfect location on the side of a hill offering wonderful views, is surrounded by beautiful mature vegetation offering cooling shade, yet is close to all amenities and the beautiful West Coast beaches, less than ten minutes walk and a mere three minutes drive. This property offers something for everyone, whether you are looking for a quiet break from the world or a fun filled holiday packed with plenty to do. 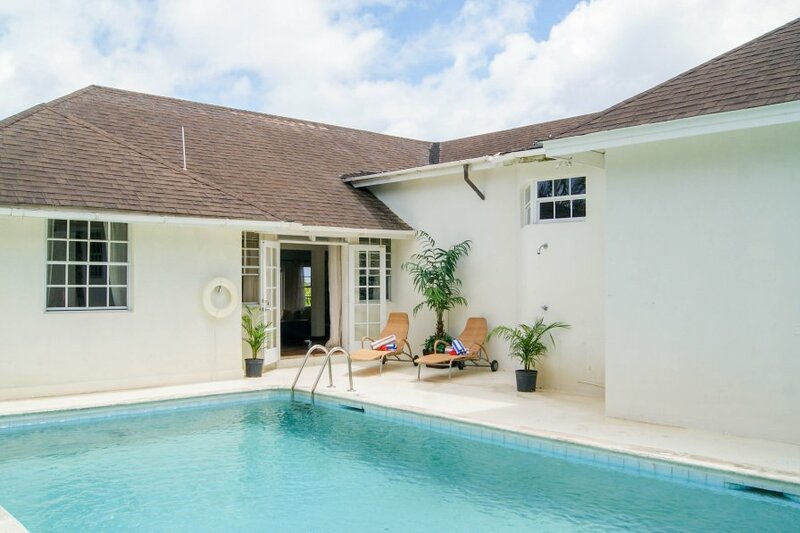 Belle View can be found within the historic town of Holetown, so there's many amenities close to the villa. Sleeping up to 10-guests in 5-bedrooms, this is a superb villa for an extended family holiday. Barbados lies on the boundary of the Caribbean and South American continental plates making it unlike any other Caribbean Island. Within the core of the island, made up mainly of coral sediment, numerous caves and underground lakes can be found. Arguably the most famous of these is Harrison's Cave; a network of caves, waterfalls, pools and fantastic stalagmites and stalactites.